Recently, I was invited to participate in a loop on Instagram called the White Vase Challenge. I was very flattered as this was an opportunity to work alongside some very inspiring designers. Our only instruction was to utilize a white vase or vessel of our choice. 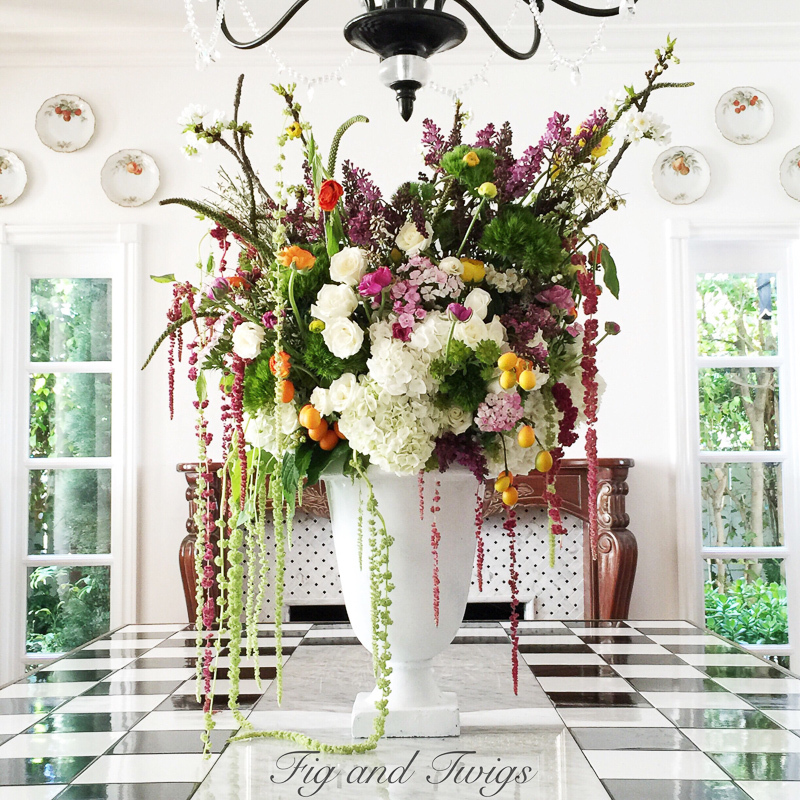 The reason it is titled a “challenge” is because everyone is challenged to create their own unique arrangement. Additionally, each designer also chooses the setting in which the vase is to be styled. You might be wondering, how does a loop work on Instagram? Everyone in the group posts their photo at exactly the same time with a link (tag) to the next person in the loop. To say we were nervous about pulling this off without a hitch would be an understatement! We set alarms, locked ourselves in bathrooms and left dinner parties to get it done. To view the White Vase Challenge, you could start at any one of the participants’ posts and navigate your way through until you were ended right back at the place you started in the loop. Fun, right? The creativity was incredible and it was such an inspiring exercise since we were able to see how each of us involved would tackle the assignment. This is the arrangement I designed and posted on my Instagram for the loop. The only items which I purchased were the purple tulips. Essentially everything else either came from my yard or my neighborhood. I knew I wanted an asymmetric design so I chose this beautiful porcelain pedestal vase. 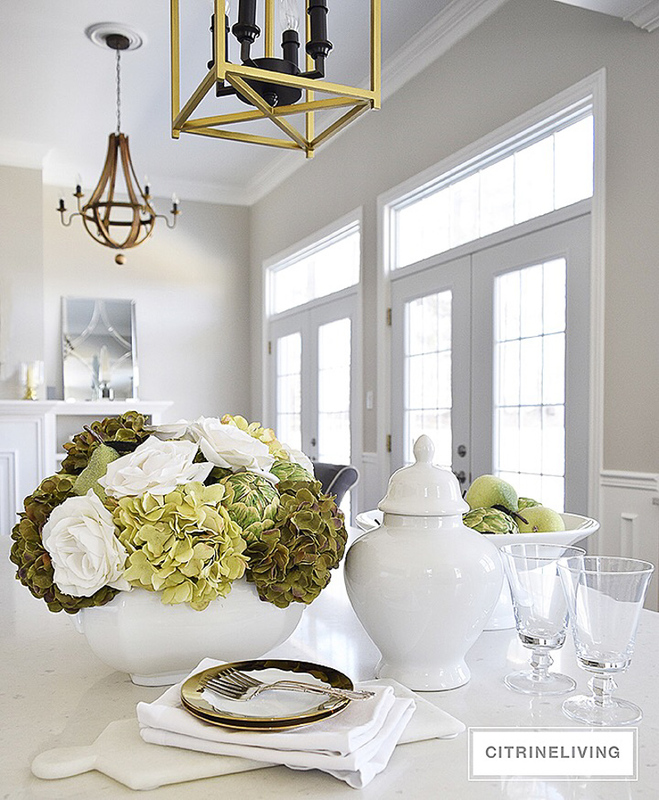 I believe choosing the correct vessel is imperative if you want to maximize the beauty of your arrangement. The pedestal allowed the sprays to hang over the edges in a lovely way while showcasing the colorful tulips. I plan to add a tutorial of a similar arrangement soon, so please check back. Zevy Joy Annie found this beautiful white milk glass vase for $3. You read that right…three dollars!!! 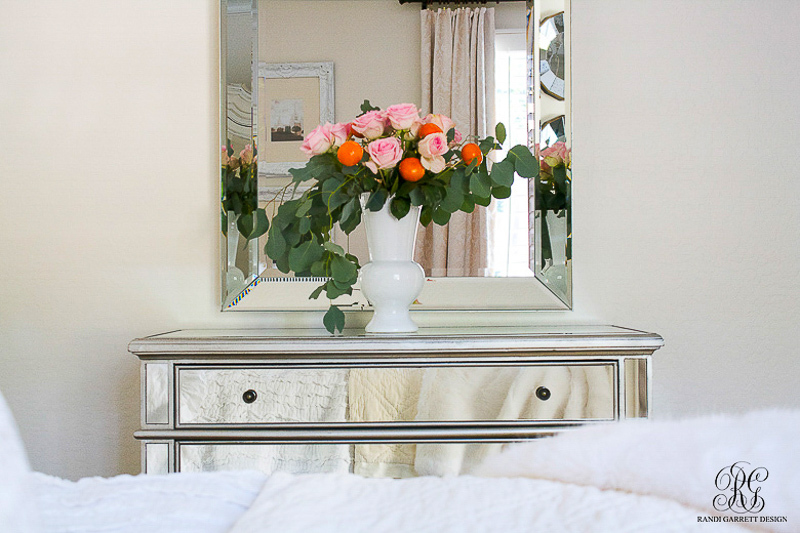 She used both faux and fresh stems and kept her color scheme soft to blend beautifully in her dreamy white home. Fig and Twigs If Janice isn’t a professional floral designer, she should be. Her arrangement is nothing short of spectacular. She used an old cement garden vase and placed it on a black and white table to allow the colors of the blossoms to steal the show. And did they ever! Kelley Nan What a creative talent Kelley is! 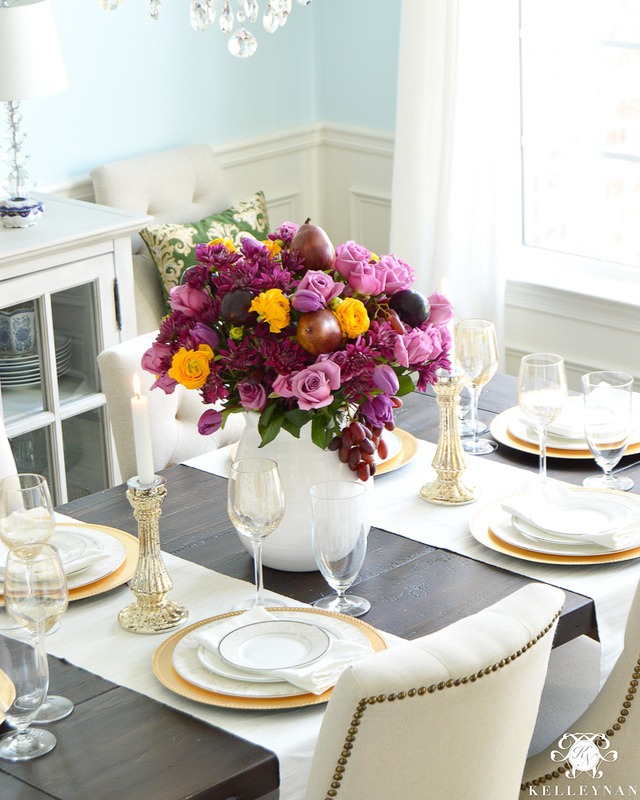 She is known for mixing stunning colors in her tablescapes and here she has done it in this lush spring centerpiece. I love the choice of an abundance of purple blooms with fruit. Old Silver Shed So simple, yet so exquisite. Sandra who lives on Cape Cod masterfully captures her roots by using an oversized shell to house piles of tulips and hydrangeas. Sandra is incredibly artistic and has conceived a design worthy of a magazine cover. Tone on Tone There are no words for how much I love Loi’s creations. He is a true master designer. Here he paired forsythia from his garden with a simple ironstone pitcher for a look of pure elegance. The House of Silver Lining Shauna got her inspiration from the produce aisle and combined radishes, parsley, and baby cabbage with flowers to surprise us with a brilliant arrangement. 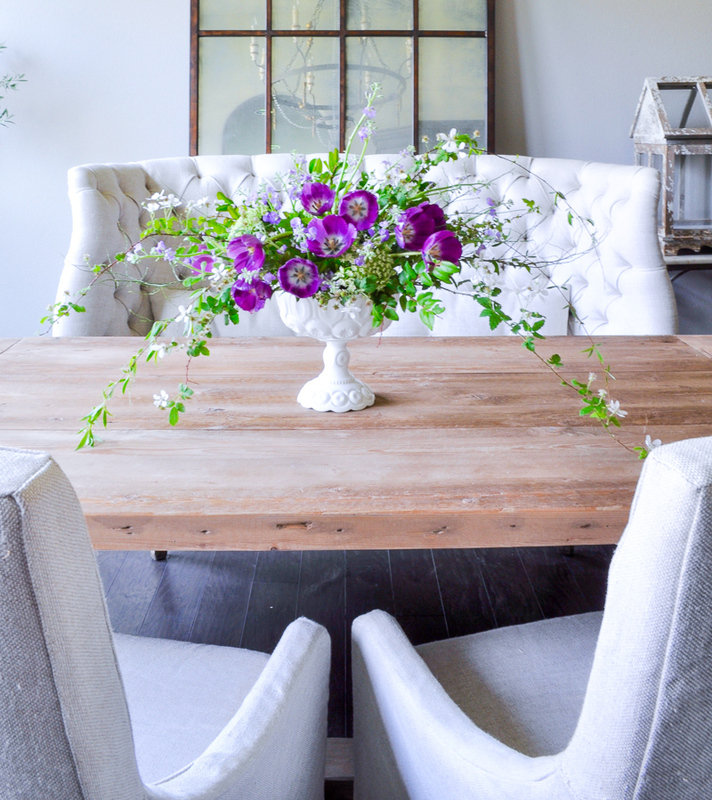 Her design proves you don’t have to spend a lot of money to put together a statement piece. Don’t miss the tutorial she posted on her blog. 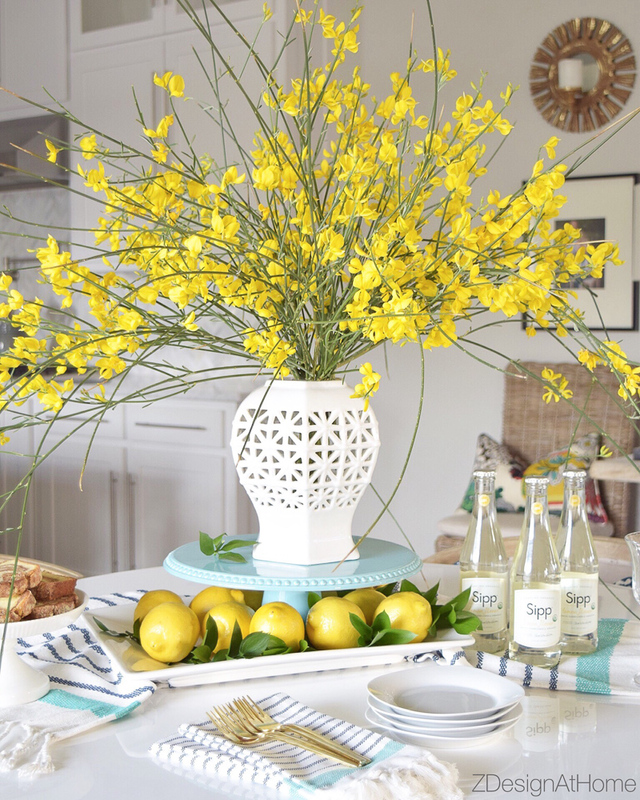 Z Design at Home As the show piece for her a spring brunch, Bree used a patterned filagree vase overflowing with forsythia and layered it on an aqua cake stand and a tray of beautiful ripe lemons. 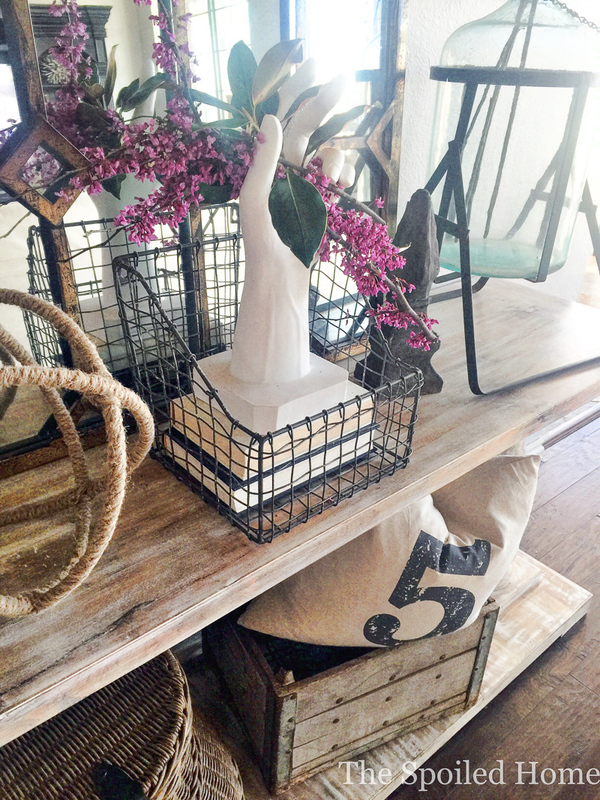 The vignette she assembled epitomizes spring and she shares the details of how she put it together on her blog so you can create something similar in your own home. 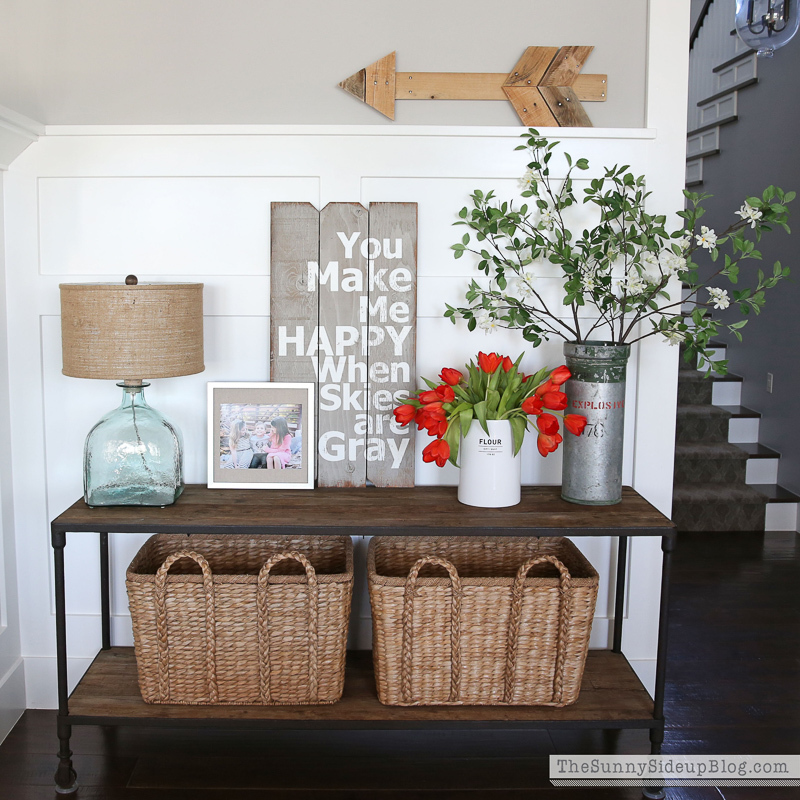 The Sunny Side Up Blog Erin used a flour canister to house her bright coral tulips as a vibrant anchor to her family room console table. I love how she added flowering branches to a taller tin vessel to canopy the flowers. Randi Garrett Design Randi’s elegant arrangement consists of eucalyptus, pink roses, and clementines. She used a tall vase which allows the eucalyptus to cascade over the sides in a dramatic fashion. Citrine Living Tamara placed hydrangeas and roses in a soup tureen complimented by artichokes and pears in multiple shades of green. To complete the beautiful vignette, she brilliantly styled the table with layers of white and gold. 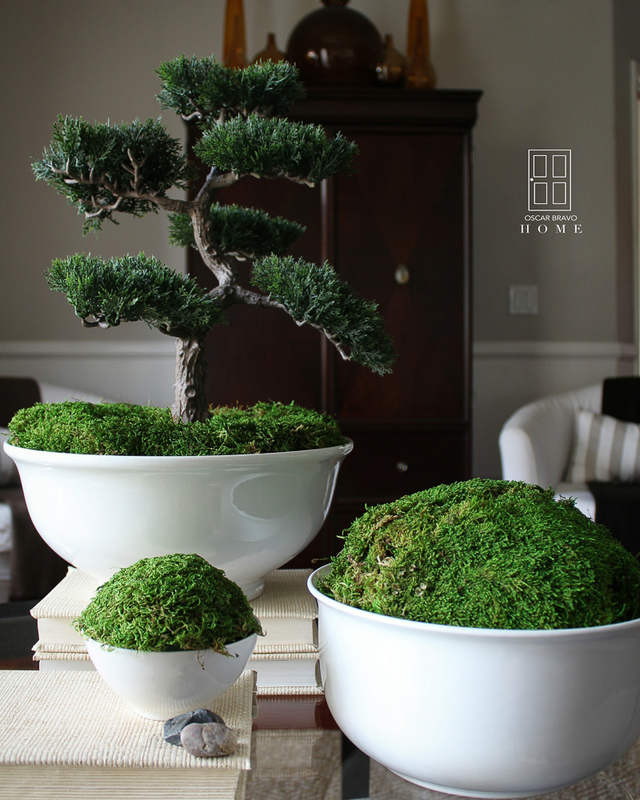 Oscar Bravo Home Moss filled white porcelain bowls were the vessels of choice for Oscar. He said he wanted to “evoke a sense of calm” with his vignette and I believe he achieved this and then some! The bonsai tree is superb. The Spoiled Home The most unexpected vessel award goes to Sandi and Shalia! Their exceptional design consists of a hand statue which gracefully holds blossoming redbud branches and magnolia leaves. Striking. The Grace House Jennifer grouped several pieces on a tray to set the stage for her lovely spring look. 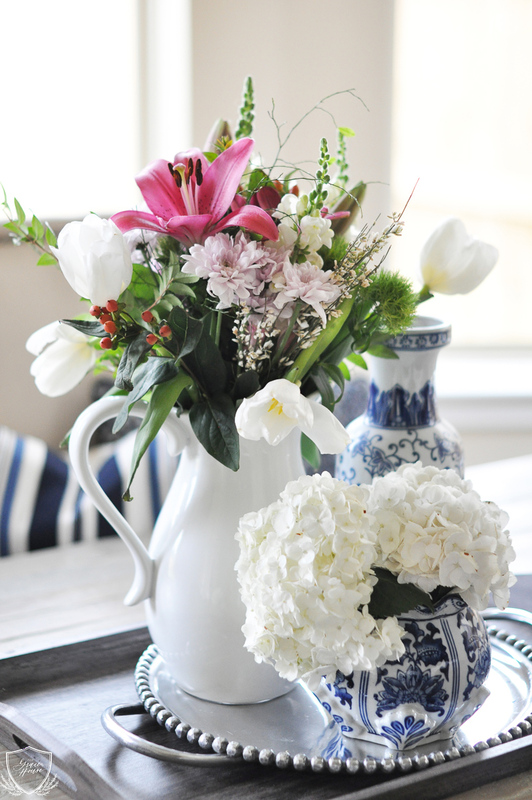 Hydrangeas in blue and white compliment lilies, tulips, and hyacinth which blend perfectly together in a white pitcher. 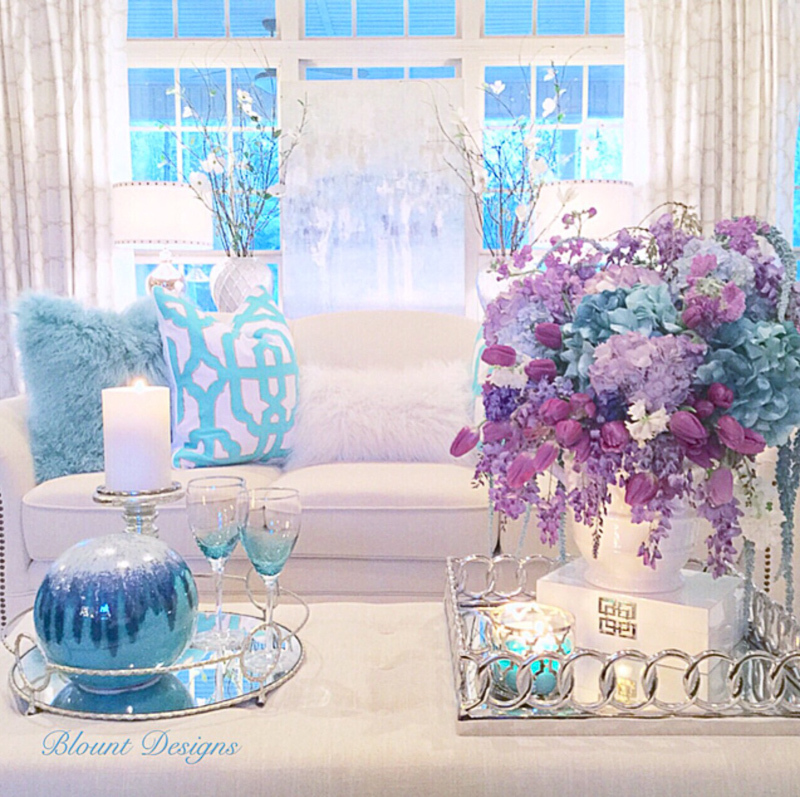 Blount Designs Deborah dazzles us with her mix of florist purchases and neighborhood finds for striking collection of aqua, lavender, and purple blooms. She even manages to use two additonal white vases filled with faux dogwood branches. I hope you enjoyed our creations and found some new ideas. Please take a moment to visit all of the blogs and Instagram feeds of this very talented group listed above. Jennifer, creating these and chatting about it with you and the rest was so much fun! Great post, and thank you for sharing! Thank you so much Oscar! Our chat truly was fun and entertaining. I hope there will be future collaborations for us! That was so fun collaborating with you and the others on this challenge. 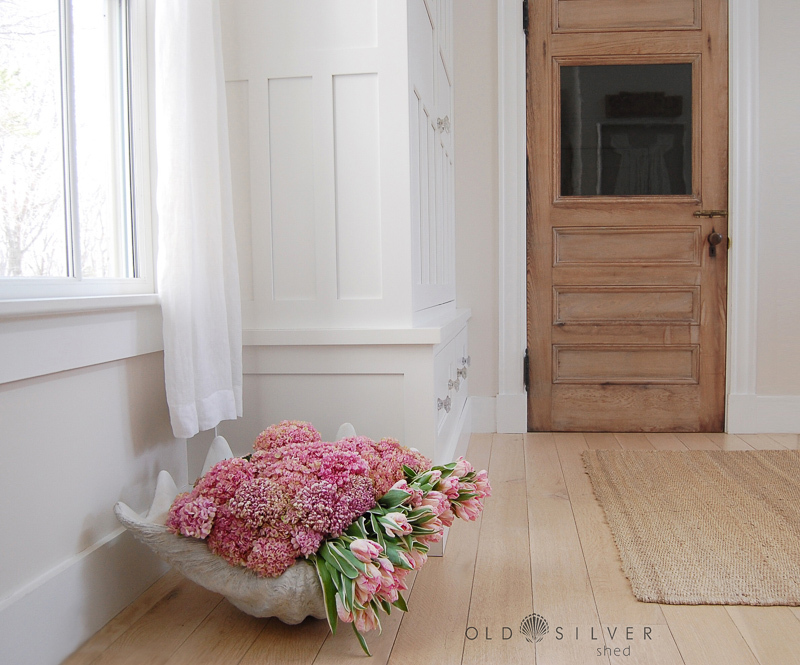 What started as a simple idea, the ubiquitous white vase, bloomed into something special. I enjoyed every second. 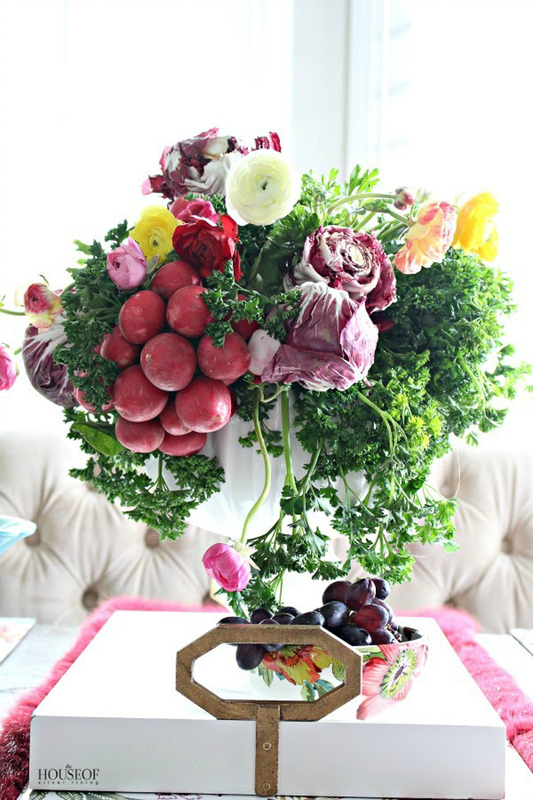 Speaking of enjoy, your arrangement of seasonal tulips with gathered greenery is stunning. Gets prettier each time I look at it. Will be back to read your upcoming tutorial. In the meantime, keep on inspiring! Thank you so much Loi! I hope you know how much I enjoyed collaborating with you. You are so talented and I look forward to more creative challenges in the future. Thanks for stopping by!!! 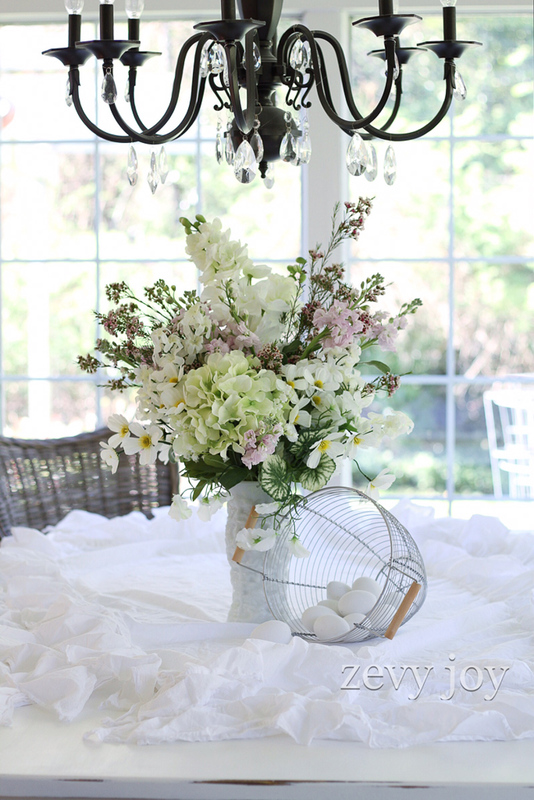 I love how you shared each beautiful white vase photo! Such a beautiful post and thank you so much for the sweet shout out! What a great group and so much fun! Your blog is just beautiful, it was so much fun working with you on this challenge! Thank you Sandra!!! Hope to be visiting your blog soon…hint, hint!